This story begins about sixteen years ago when I first moved to North Carolina from New York. For most of my life I have been an avid Salt Water fisherman and have always yearned to own a boat. Moving to NC presented and opportunity to have some fun with fresh water bass fishing. I did that with a vengeance! I was at the lakes three or four times a week, learning the ropes and generally having a blast with this new aspect of a sport I have loved all my life. It wasn’t long before I came to the conclusion that I needed a boat. How else would I get into the nooks and crannies in the lakes I fished where all the monster bass were hiding? I found an ancient 14 ft. center console boat with a halfway decent motor. Of course, considering what I paid for it, there wasn’t a whole lot of life left in that “the boat”. I fished it hard though, I was on the lake at least four times a week. Six month after I bought it, “the boat” started being plagued with minor problems. The engine was touchy; it would run for five minutes and then bog down, apparently starved for fuel. The transom was completely rotted out. For those of you not familiar with boats the transom is the back of the boat, the part that the engine is mounted too. I’m not particularly afraid of sinking in a small boat, but a rotten transom has another potential danger, having the engine tear itself loose and bonk you on the back of the head is a major motivator to fix or replace. So I did, I sold the “tub” for a few hundred bucks and got a new boat. It didn’t take me long to visit one of the largest boat dealers in the central North Carolina region. A half hour ride got me there. I was in an adult playground loaded with boats of all different shapes, sizes and functions. I wanted to get something that I could not only fish with, but have the flexibility to spend the day out on the lake with the family. My basic requirements were that it have a livewell, seating for at least six and a decent size engine. Of course no boat comes with everything you need, so I had to add a trolling motor, depth finder and life vests to the list of “options”. I left the boat dealer $16,000 in debt (no money down, how easy was that?) and the owner of a brand new 17 ft. Sunbird with a 90 HP Evinrude engine. I picked that boat up a week later and used it, a lot. Initially I kept up my original pace. Four trips to the lake a week were the norm during the warm summer months. By the second year that has tapered off to one or two times a week. That is until the engine on it quit and refused to start. Being the DYI kind of guy that I am, I tinkered with it some but couldn’t resolve the problem so decided to take it to the dealer and have it serviced. The drive to the dealer was uneventful. I unhooked the boat trailer and they hauled it into the shop so they could run some diagnostics on the engine. Having some time on my hands I did what every red-blooded American make would do. I browsed and drooled over the boats in the showroom. I won’t punish you with a long and drawn out story of what transpired next but the net of it was that I left with a brand new 17ft hurricane that seated two more than the last boat and had a 130HP engine. Oh yeah! I now had $17,000 of debt after trading in the old boat, paying off its loan and financing the balance. Of course, this was a ”no money out of pocket deal”. Hey, it was a 10 year loan so the payments were low. It’s unbelievable how easy they make it to get suckered into facilitate buying a new boat! The first few weeks with the new boat were a blast, we had it out every weekend, either fishing or just enjoying a day on the lake. For reasons unknown, this rapidly tapered off to once a week, then to once every two weeks, and eventually to once a month. Winter came along so I winterized the boat and put it up. Once spring came around I took the boat out a few times and enjoyed some early season bass fishing. After that the boat was parked and there it sat, and sat, and sat some more. If I remember correctly the boat sat there all summer and never got used for the rest of that year. I did drain the carbs and start it periodically so that things wouldn’t get all gummed up, but it didn’t hit water for the rest of that year. The following year the boat did much of the same. It was a nice big expensive lawn ornament. I kept up on the maintenance and of course continued making my monthly payments as well as keeping my insurance current on it. I at least wanted to keep it ready to go in case I got the bug and needed to run down to the lake. The boat never got used that second year after I got it. Another winter came and went and I decided that we were going to use it come hell or high-water so one warm May Saturday, I put some fresh gas in it, checked the oil and off we went. I’ll admit we had a great time, I got the boat completely airborne once (which my wife will never let me live down) and it was always fun to get funny looks from bass boats as you blew them away down a stretch (that boat had a top end of 70 mph, which is light speed in recreational boating). During the drive home after getting the boat on the trailer the thought struck me that this was the first time this boat had been used in two years. Two years! Some quick mental math told me that I had spent better than $6000 on payments and insurance, and used the boat once! My $6000 boat ride! I could have rented a boat for a fraction of that! The first priority after parking the lawn ornament was getting some pictures of it, and putting a craigslist ad up. I ended up selling the boat about a month later and got enough out of the sale to pay off the balance of the loan. So I can say that I “broke even” on it but that was after years of making boat payments on a succession of boats that I probably should have given a lot more thought too before buying. I think my first boat purchase was a deal, it was extremely cheap, all cash and I got my money’s worth out of it. The second boat was somewhat less of a wise purchase decision, but I did get a lot of use out of it. For that boat I should have tried to pay cash or at the very least put a large down payment on it rather than finance the entire package. The third boat? That was a ridiculously stupid decision on my part. It put me deeper in debt for a questionable asset. I should have seen the trend that was developing in terms of how I used the last boat. Unfortunately I was blinded by the dazzle of a new shiny toy. Do you really think or know how often you will use it? Are there alternatives to buying it (rent or borrow)? Does it really have to be new? What would you do with the money if you didn’t buy it? Here’s one more interesting note on the boat story. I met the gentleman that bought the boat from me a few months later at the Gym we go too. We have become acquaintances and I eventually asked him if he would consider renting the boat to me periodically. He said that wasn’t necessary, I could use that boat anytime I wanted to for free, all I had to do was replace the gas. I haven’t taken him up on the offer but thought that this scenario is the perfect way to have access to a boat! Incidentally, it’s been about four years since he bought that boat from me. The last time I spoke to him he told me that it has sat in his barn for the last two years and hasn’t been used in that time! I wonder if this happens to all boat owners. I have since found out that it is possible to buy donated boats, which provides a number of benefits. For starters, donated boats are less expensive than buying brand new, as they have been previously used. Second, the money that I spend on the boat goes directly to charity, so even if I do end up overpaying by a little bit, at least the money goes to a good cause. I am unsure if I will ever buy another boat, due to my past experiences. However if I do, it will likely be a boat that someone else has donated to charity. Do you have a costly compulsive buy you would like to share with us? I have a $10K BWM bike that is stored in France and I will use 4 weeks this year. I used it 6 months last year and rode 20K miles but in the future it looks like it will only be for the occasional holiday. I don’t really care, it is paid for, I love it and I want to ride it until it dies, selling it would be a loss just to buy another one in a couple of years. It sounds like you get enough use out if it to make it worth keeping, especially since it’s paid off! Jose, this is a perfect example of what so many of us do so much of the time to waste our money! We get caught up in the shiny newness of whatever, only to find out later on that we wasted a whole “boatload” of money. Thanks for sharing a very poignant story. I love it, “boatload of money” is a perfect description. You hit the nail on the head though, the shiny newness of a thing is what can lead us into making purchases we probably shouldn’t! Wow, that was a pricey boat ride. There are many people who spend money to buy things on credit that hardly gets used after the initial excitement has worn off. I guess it must have hit you hard to do the math but likely a good way to put it all into perspective. It was and it did! Perspective is an amazing thing to have, unfortunately it’s usually after the fact that we take a hard enough look at something to see the perspective. That is exactly why we won’t go to one of those showrooms for campers. We have a tiny pop up that we bought used for a good price. We actually use it quite a bit in the summer. I’m too old for tent camping. The camper is getting old, and some of the awnings and interior is dinged up, but camping isn’t really meant to include all the most modern conveniences. When our camper finally bites the dust, I think we will either rent cabins or see if we can find a similar deal on a used one, but I know I’d be tempted to get something fancy if we went to the dealer. It sounds like you get good use out of yours and if you think about it, it’s an investment rather than a financial burden. I’m sure that it saves you money since you use it rather than rent a cabin. I would definitely consider getting another used one. The funny thing is that even though my story shows how we can make financial mistakes when buying something we don’t really need, it also reflects that it creates a potential buying opportunity for someone else! If I ever buy a boat again (which I probably will when there’s more time in my life for one) I’m 100% certain it will be someone else’s mistake, lol. Oh, Jose, how we are so similar. My compulsive buy was a Jetski. Brand new, out the door for $10k. I thought it was awesome. Well, a couple years later, it completely crapped out and then the manufacturer wouldn’t take care of it, so I had to sell it for about $800. I am about to put my story up on the site. It sounds so similar to yours. You have my sympathies. My own lawn ornament came “free” courtesy of a brother-in-law. It was free if you don’t count the used motor I had to buy to replace the crappy Mercury with the blown piston. 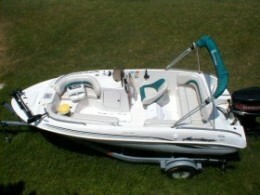 Still, a 15-foot all-purpose boat and trailer for an all-in cost of $1,600 (with the “new used” Evinrude). That works out to about $200 a boat ride so far, over 3 years. Yep, a few more days on the lake, and it’ll have made sense to have bought over rented. In the meantime, there it sits. I bet if we lined up all the lawn ornament boats in the world end to end we could circum-navigate the globe a few times. Maybe there’s a potential market in doing something with all those boats? It doesn’t sound like you’re too far in the hole with yours though. Get out on the lake a few times this summer and you’ll be past the break even point! I was listening to a podcast recently talking about being organized. The person said that the less stuff you have, the easier it is to organize. I’ve thought about this a ton the last couple of weeks….all those “things” I needed that I’ve used a few times and now they’re sitting around the house (or garage). How much stuff can I use at one time? One. How many things do I already own that are just sitting around waiting to be used again? Thousands…. I don’t have much experience with power boats, but the maintenance on even small sailboats adds up the incredible figures. Maintenance is expensive. Just keeping the carbs clean and ready to go on an outboard can be a PIA and expensive if you let the jets clog up from lack of use. I’m not familiar with sail boats but can imagine that with so many moving parts it’s got to be as intensive as well. It’s crazy how easy it is to get sucked into a spiral like this. People are more aware now since the financial crisis/recession hit but a few years ago it was just the norm for most people. Really enjoyed this post Jose. It is a spiral, I got sucked into this one bad, more like a vortex than a spiral :)! At least I got some good use out of the first two boats, that third one was a blow out though. It’s nice to see someone so passionate about what they like. If it’s making you happy, no matter how expensive it can get, as long as you are happy, go for it. And don’t regret anything. The first boat made me happy and got use, the second one, so-so. The third one was a waste of money! We have a small boat in the driveway that has tarps over it that we bought for less than $200. It doesnt’ have a motor, and needs some work but it’s a project of my partners. When he does have a motor for it and it’s fixed up we’ll use it a lot. That doesn’t sound too bad. $200 is a drop in the bucket. Once you wrap project and DIY around anything it becomes ok in my book, lol. They are, especially when it comes to repairs! It sounds like you use your a lot so it would be worth fixing. Pingback: Today, Fearless Men hit the 1 year milestone!